NEW YORK - June 13, 2012 -- Not many children's brands can stand the test of time, entertaining and educating generation after generation. Magic School Bus: The Complete Series , which recently celebrated its 25th anniversary, is one such brand. This September, as children head back to their classrooms, they can hop aboard the world's most famous school bus for exciting and unforgettable lessons as Scholastic Media re-launches to DVD the timeless, Emmy Award winning TV series. On September 7, Scholastic Media and New Video, the distributors of the award-winning Scholastic Storybook Treasures series are partnering to release the perennially popular series in several configurations featuring all new packaging and never-before-released content. 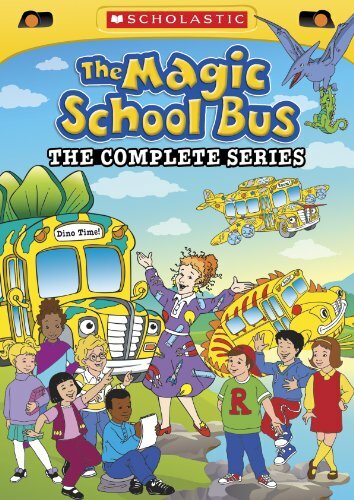 Magic School Bus: The Complete Series ($79.95srp) brings together all 52 episodes of the program - including 30 which are available for purchase for the first time - on 8 DVDs. Featuring a striking 3D lenticular cover with new artwork that makes the vibrant characters leap off the page and that will encourage kids to ask the question "how did they make that?" , the collectible thin-pack set also includes a guide for kids with teasers, trivia and experiments, plus a Parents' Guide with lessons and learning options. This interactive guide creates wholesome and healthy entertainment for the entire family. Also new to the line - and just in time for Back to School activities -- will be two special 3-pack configurations, which will each include more than four hours of THE MAGIC SCHOOL BUS adventures! Join Ms. Frizzle to explore everything from the smallest cell to the largest galaxy in the universe with THE MAGIC SCHOOL BUS: BLAST OFF! FROM SEA TO SPACE and THE MAGIC SCHOOL BUS: FIELD TRIP FUN AND GAMES. Both, priced to add to every home library at $24.95srp, feature 12 episodes, some releasing for the first time. * The Human Body - Science topics include digestion and body mechanics. * Super Star Power - Science topics include stars and cells. * Takes a Dive - Science topics include coral reefs and tidal zones. * Takes Flight - Science topics include weather and flying. Poised to deliver fun and learning in a whole new way with the massive Magic School Bus: The Complete Series , two new DVD sets and four single titles, excitement will soon be rolling into the marketplace on the heels of an enormous 25th Anniversary push for the brand. The only question? Where will the Bus take you? The Magic School Bus(R) books, published by Scholastic, have been capturing children's imaginations since they first book rolled onto shelves in 1986. Since then, the acclaimed series has sold over 60 million books and spawned a successful animated TV series, which premiered in 1994, with support from The National Science Foundation. Now the longest-running science series to air on television, the star-studded program features the voices of Lily Tomlin, Wynonna Judd, Dolly Parton, Tony Randall and Malcolm-Jamal Warner. Along with the adventurous and energetic Ms. Frizzle and her pet lizard, Liz, the entire class - along with the audience -invites students to explore volcanoes, the inside of the human body and much, much more! New Video, a Cinedigm company, is a leading entertainment distributor and the largest aggregator of independent digital content worldwide. Headquartered in New York City, with an international presence in 45 territories, the company delivers feature films, TV programs and web originals via digital download, streaming, video-on-demand, Blu-ray, DVD, and theatrical release. In 2011, New Video bowed Oscar-nominated Hell and Back Again and international blockbuster Elite Squad: The Enemy Within in U.S. theaters. The company's library includes original TV series and movies from A+E Home Entertainment, HISTORY(TM), and Lifetime, unforgettable games and trophy sets from Major League Baseball, storybook treasures from Scholastic, award-winning documentaries from Docurama Films, next-gen indies from Flatiron Film Company, and acclaimed independent films and festival picks through partnerships with the Sundance Institute and Tribeca Film. New Video is proud to distribute many Oscar-nominated films including GasLand, Waste Land, The Secret of Kells and Chico & Rita. Cinedigm Digital Cinema Corp. (CIDM) is a leader in providing the services, expertise and technology that are critical to transforming movie theaters into digital entertainment centers. Its deployment entity, state-of-the-art distributor and exhibition software, and marketing and distribution platforms are cornerstones of the digital cinema revolution. The company recently acquired New Video to form a full-service, end-to-end digital studio that acquires content for theatrical distribution and across digital, mobile and home media platforms. New titles poised for release in 2012 include The Invisible War, Citadel, In Our Nature and 22 Bullets.